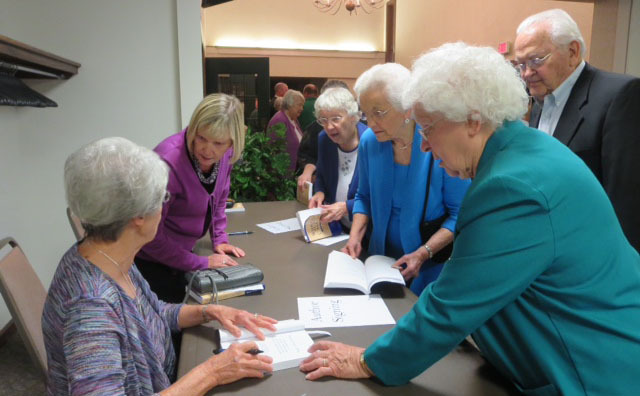 Record attendance marked the release of the latest Historical Society publication of three biographies, Worthy of the Calling, on Saturday, October 4, at the Historical Society’s annual meeting at the Grantham (Pa.) Brethren in Christ Church. The book features biographies of three couples who have been prominent in the Brethren in Christ Church over the past several decades: Paul and Lela Swalm Hostetler, written by their daughter Beth Hostetler Mark; Harvey and Erma Heise Sider, written by Harvey’s sister AnnaRuth Osborne; and Luke and Doris Bowman Keefer, wrtten by Devin Manzullo-Thomas. The meeting began with dinner in the Fellowship Hall, capped off by the traditional home-baked pies, and then moved to the auditorium where Emerson Lesher, president of the Historical Society presided over the program. Providing a context for the release of the book of biographies, Paul Nisly, a retired English professor at Messiah College and long-time member of the Society, spoke on the art and purpose of biography. Morris Sider, the book’s editor, introduced the book with remarks about the couples in the book and presented a copy of the book to each of the authors, who in turn spoke briefly about their experience writing the biography. The authors then presented copies of the book to their subjects who also had the opportunity to respond. Members of the Historical Society receive a free copy of the book. Additional copies are for sale at $15.00 each plus shipping. Contact the editor to order. The Historical Society is co-sponsoring a series of public events in central Pennsylvania preparing for Pennsylvania 2015, the global assembly of Anabaptist-related churches, including the Brethren in Christ, which will take place July 21-26, 2015 in Harrisburg, Pennsylvania. We hope many of you who live in south-central Pennsylvania will plan to attend one or more of these events. Brochure listing all events. In 1989, a can of Campbell’s tomato soup cost $.33 and an 18 oz. box of Kellogg’s corn flakes cost $1.69; a gallon of gas cost about $1.12. 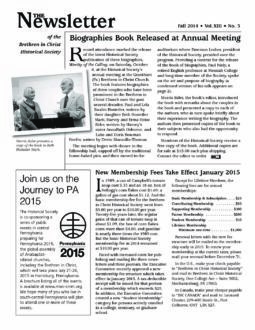 And the basic membership fee for the Brethren in Christ Historical Society went from $5.00 per year to $10.00 per year. Twenty-five years later, the regular price of that can of tomato soup is about $1.09, the box of corn flakes costs more than $4.00, and gasoline is nearly three times the 1989 cost. But the basic Historical Society membership fee in 2014 remained at $10.00 per year. Renewal letters with the new fee structure will be mailed to the membership early in 2015. To renew your membership at the current rates, please mail your renewal before December 31. In the U.S., make your check payable to “Brethren in Christ Historical Society” and mail to Brethren in Christ Historical Society, One College Ave – Suite 3002, Mechanicsburg, PA 17055. In Canada, make your cheque payable to “BIC CANADA” and mail to: Leonard Chester, 209-400 Steele St., Port Colborne, ONT L3K 5Z7. In early 2015, the Historical Society in partnership with the Friends of Murray Library at Messiah College will release a biography of Dr. David and Jean Byer, written by Morris Sider. The book will honor the Byers for their many contributions to Brethren in Christ World Missions, Messiah College, and the Historical Society. For many years, the Byers lived in Rochester, Minnesota, where David was an anesthesiologist at the Mayo Clinic. He passed away in November. Members of the Historical Society will receive a free copy of the book when it is published. One of the amazing things about this multi-generational biography is that we are shown so much that is negative about the family: lies, cruelty, favoritism, cheating and general dysfunction. Finally, though, it is a story of faithfulness. Ultimately, there is reconciliation and forgiveness after all the dysfunction in the family. In this story of great expectations we see God at work in a very fallible family. As this account suggests, biography is an ancient art. But it is a very persistent, continuing art form. Thomas Carlyle, the great nineteenth-century essayist, historian, and philosopher, thought that history was essentially the story of “Great Men”—and he really meant males! In his book On Heroes, Hero-Worship, and the Heroic in History, he writes, “Universal History, the history of what man has accomplished in this world, is at bottom the History of the Great Men who have worked here. They were the leaders of man, these great ones; the modellers, patterns, and in a wide sense creators, of whatsoever the general mass of men contrived to do or to attain . . .” (p. 239). We find a very different approach to “great men” in Michael Hall’s 1988 biography The Last American Puritan: The Life of Increase Mather. Increase Mather was the father of the more famous seventeenth-century Puritan, Cotton Mather. But this biography of Increase Mather has a very different intent than the relatively short biographies which Carlyle wrote. In this biography he explores not only Increase Mather—but his family: his father Richard and his son Cotton, to name the most important ones. And woven into the biography is the significant impact of the Mather family on New England Puritanism. To illustrate the issue further I will mention three very personal biographies. The first, James McBride’s The Color of Water: A Black Man’s Tribute to His White Mother, is a very affectionate—but also quite revelatory—biography of the author’s mother. Not much seems to be held back, and McBride reveals quite a bit about himself as he writes about his mother. On the other hand, Ervin Stutzman, a friend and colleague of mine (who like me also grew up in Kansas) is quite circumspect in his Tobias of the Amish, the story of his quest for his father. Stutzman’s father was killed in an automobile accident when Ervin was three. The book is meticulously researched, carefully written and rewritten—but it says very little about the son and author, who keeps himself safely at some distance. But in his biography of his mother, Emma, Stutzman allows himself to be much more personally engaged. As he writes, “I chose to face into my fears when several readers of my first draft, particularly women, voiced the hope for more glimpses into Emma’s inner life, the interior conflicts that remained largely hidden from public view” (p. 15).” In the process of that exploration, Stutzman also reveals much more of his own inner life. I began with a reference to Great Expectations, Dickens’ powerful tale of a poor boy who thinks he has a huge fortune coming—and somewhat loses his way. He is really a rather ordinary person who needs to reclaim his more authentic simpler self. Perhaps we, too, may learn more about the history of our time and place through seeing life as experienced by “ordinary people.” Our ordinary lives may also embody great expectations. Paul Nisly is retired from many years of teaching and administration at Messiah College. He is a pastor and bishop in Mennonite Church U.S.A. and lives in Grantham, Pa. This article is excerpted from his talk at the annual meeting of the Historical Society in October. Given the recent attention given to the Ebola outbreak in Western Africa, it is interesting to read reports of Brethren in Christ workers dealing with epidemics in years gone by. The following is excerpted from a letter written by Esther Book (Ulery) to her family in Upland, California, in April 1948. In December 1946, Esther left for India under a three-year assignment with Mennonite Central Committee. India had received its independence the previous year, so refugee camps were established by the government to facilitate the movement of Indians in Pakistan returning to India, and Pakistanis leaving India for Pakistan. She taught in a Mennonite High School in Madhya Pradesh for one year and then went to Lahore, Pakistan, to do inoculations for cholera. There she worked with identical twins Ada and Ida Stoltzfus under the direction of Martin Schrag (later to become a long-time faculty member at Messiah College) who was the team leader. Later they worked in Kashmir where she helped to distribute 10 tons of donated clothing to poor people in the mountains. Esther came home from India in 1949, returning in 1953 as a Brethren in Christ missionary. After studying Hindi for two years, she became head of a girls’ day school at Saharsa. The school was small until boys were admitted when it reached a capacity of 350. After three seven-year terms as a missionary headmistress at Saharsa Grade School, Esther turned her responsibilities over to Mrs. D. M. Roy, an Indian national. Ada, Ida, and I went to work on Wednesday morning, but not with the displaced women’s program. Tuesday, we – including Martin [Schrag] – went with Colonel Small out to Camp Shahdrah where 54,000 refugees are placed. At this camp and also at Waldon Camp, both cholera and small pox have broken out in the regular hot season epidemics. So Colonel Small gave us equipment and since Wednesday we’ve been giving cholera inoculations. This camp is in poor condition – the people have no soap or proper water facilities for bathing or washing. Food is cooked in common mess at several places for the different sections of people, but rations are meagre and, we’re told, won’t last. Some people have gone without food for several days and they tell us, “why give us needles (inoculations) – we’re just going to die anyway.” Most rations don’t exceed 1,200 calories per day and that’s a small half of what it should be. Camp is about 9 miles from the college here and so far the government has issued us enough gas for our jeep. We three girls got driver’s licenses because soon we will be all alone. Martin left on Wednesday after he had our jobs sorta settled and Menno Diener will soon go back to C.P. and we will have the jeep in our possession. Colonel Small (an English man who oversees this particular refugee camp) is trying to get us a bungalow so we can live nearer our work. That will be nice but maybe it’s rather useless for just 4 more weeks until our unit meeting—that is, if gas continues to be issued for this work. We’ve each given several hundred injections. We do about 300 or 400 in a day. here is no system, so it’s much more difficult to give injections here than it would be [at home]. People don’t realize the danger of these diseases…. People hide from us, run away or refuse to take the injection, so a total [inoculation of the entire camp] is impossible to attain. Shahdrah Camp has had several deaths from cholera, but not as many as at Camp Waldon, a bigger camp out from Lahore, the opposite direction from our camp. Yesterday, I saw a pathetic sight – a little boy about 4 years old. He had just a ragged shirt on and he was eating rice with his skinny fingers which were covered with flies. Flies sat all over his nose and mouth and he was so inert that he made no effort to chase them off. One could scarcely see whether he was eating rice or flies. He was sick with dysentery, no doubt, so he was completely skin and-bones…. When I came near, he didn’t move, but just rolled his eyes up to see me. I gave him an injection and big, big tears rolled down from his little face. How I wished for a big orange or banana to give him, but then there were 2 doz. other little children standing around who would want some too. I did take an auna (2 cents) over and gave it to him just before we left. He took it in his fingers and didn’t move a bit except to turn his eyes sidewise to see me…. It seems to be a work without a beginning and without an end.here’s so little that we can do. Elaine Snider and Caroline Plank will soon come over here from Amaritsar High school where they were working in an orphanage. Their work there has been closed, so they will probably help in some other refugee camps. Menno is taking care of their placement before he goes back to C.P. where his wife and baby daughter are anxiously awaiting for him. Our bungalow out near the camp has electricity and I think it will be quite nice…. The bungalow and camps are situated near the Ravi River – about ¾ mi. There are boats on the other side which we hope we could use if we move out there. It would be a pleasant respite after a hot day of work. Yesterday it was over 104 degrees and today promises to be hotter. The bungalows feel cool compared to the outside. Manry’s house is screened so we don’t use mosquito nets at night, but some manage to get in and pester us at night. We wish we could sleep out under the tropical moon, but since we live upstairs it’s difficult to move the beds around. We have nets but no poles. We go to camp right after breakfast (or as soon as we pump up a tire) at 7:30 and get back for lunch around 12:30. We go again at 3 o’ clock and work until about 6. So we have lots of driving, and the roads are crowded with ox carts, pony buggies, people, cows, and dogs…. We feel so exhausted when we get home that we can scarcely walk up stairs. It must be the heat for it isn’t such hard work, however it is rather strainous [strenuous]…. 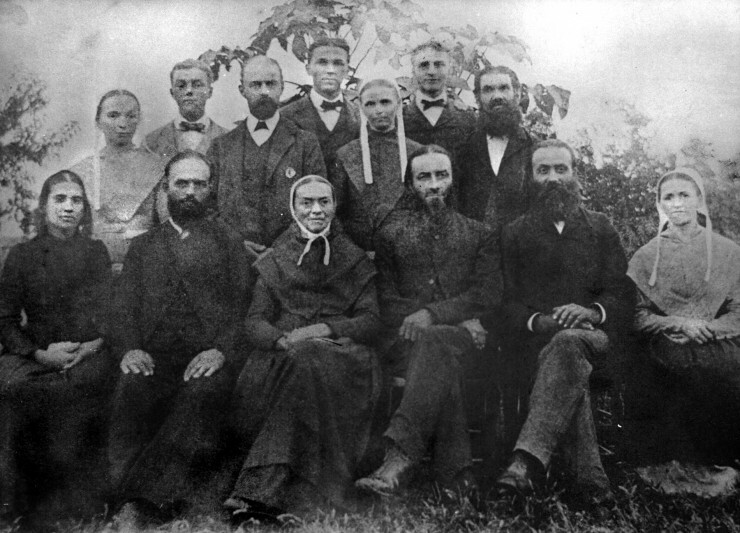 Jesse Engle was one of the first five Brethren in Christ missionaries to Africa. Since there are only three photographs of him in the Archives – and none of him close up, we were excited by the prospect of acquiring his family photograph. But when we opened the box, we did not find any photograph marked “Jesse Engle Family Portrait.” However, we did find this rather faded photograph loose in the box, without any identification and without any obvious connection to any other photographs or albums in the box. We offer the photograph here with the hope that someone might be able to (a) verify with certainty that it is a Jesse Engle family portrait, or (b) identify it as a photograph of some other family.